One of the services that we’re proud to offer here at E-Complish is our Text2Pay SMS payments system and software. 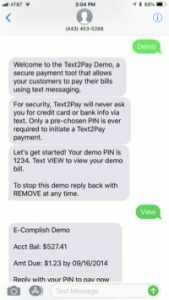 Text2Pay takes advantage of SMS technology to enable making payments to be faster, easier, and more secure for customers. How does Text2Pay achieve this? It has to do with leveraging all of the advantages of SMS by way of our unique, secure software. When payment by text is thought of, the normal thought process is something like this… A SMS payment method or system is used, the consumer uses a ‘short code’ which is a small set of numbers like 123456. They text 123456 and the cost of what was bought either gets added to the customer’s monthly phone bill or else gets deducted from a pre-paid balance by the mobile phone operator. Text2Pay is a little different. Text2Pay is not meant to be used for purchases, but rather for payment of existing bills and/or debt of some sort. 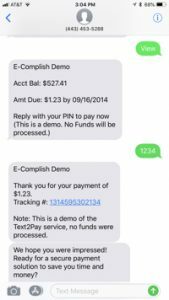 A business that offers Text2Pay to its customers is one that has an on-going relationship and invoices the customer in a recurring manner. The customer would establish a Text2Pay account to pay their bill. There are two basic, elemental ways that a Text2Pay account can be utilized. One way uses a Bill Reminder Only approach and the other is establishing an online ‘wallet’ for Bill Reminder and Payment. Here, a consumer, while online at a business’s website, can enroll in Text2Pay and choose Bill Reminder Only or Bill Reminder and Payment. To start, the consumer enters their mobile phone number into the website. The consumer is then sent a validation code to their mobile phone number they provided. The consumer then enters that code into the website to verify that they own that mobile phone number, (this is fulfilling FCC opt-in guidelines and procedures). If the consumer chose Bill Reminder Only, they are now enrolled, and they are done! If the consumer wants the added feature of making payment when they receive their bill reminder, they can establish a secure online ‘wallet’. To do so, they can securely store a credit card, debit card or bank account. Once they have created their wallet, they are asked to create a 4-6-digit PIN (Personal Identification Number). The PIN is the mechanism that is used to actually make the payment, via SMS when they receive their bill reminder. If it sounds simple…it is! In the future, the business will prompt E-Complish to send the SMS text on its behalf. The SMS text will be sent out to all enrolled Text2Pay customers with a detail of their upcoming bill. If they were enrolled in Bill Reminder and Payment, they will be asked whether they would like to make their payment now, and if so, to please enter in their 4-6 digit PIN. Once the 4-6 digit PIN is entered and verified, Ba-Da-Boom, the payment is processed using their previously stored credit/debit card or bank account that they stored in their wallet. They are then sent back a confirmation code and the payment of their bill is history. So why are SMS payments growing so quickly? The advantages of SMS payments are many, which is why more and more retailers are understanding the awesome bottom-line power that offering an SMS option gives them. Consumers love SMS payment systems because, as mentioned above, they’re quick and easy to make use of, especially in today’s mobile phone obsessed culture, where websites can be accessed and text messages received and sent nearly anywhere, twenty-four-seven. You might think that such a powerful, far-reaching service is difficult and expensive to get set up. No. It’s easy and inexpensive. It cannot be stressed enough how fast, easy, and safe an SMS payment service like Text2Pay is. Consumers love their smartphone and they love SMS, which is why the mobile payments market is skyrocketing. At E-Complish, we’re confident that we’ve designed and implemented one of the best and most secure SMS payment services with Text2Pay.